Contexts and Dependency Injection (JSR-299) support in Maia has been significantly improved. Enhanced dependencies diagram, and more. 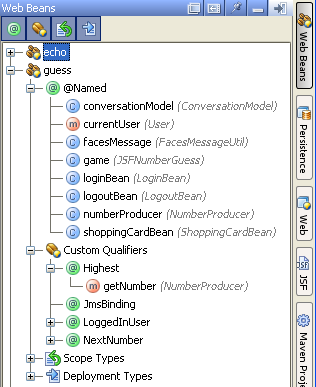 This entry was posted in New Features and tagged CDI, Code Navigation, Maia. Bookmark the permalink. I notice one thing that’s a little wrong. The note about the unproxyable type should go on the injection point that resolves to the bean, not the bean itself. 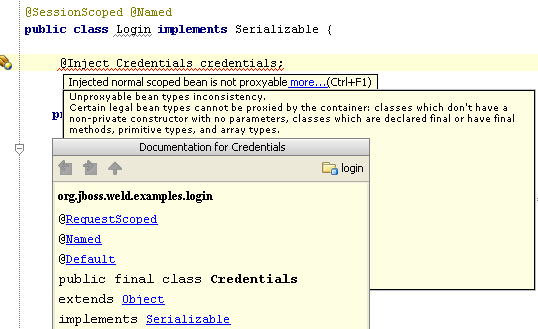 It’s totally legitimate to declare a normal scoped bean with an unproxyable type. You might only be using it from EL, for example. The error is trying to inject it into something, using the unproxyable type as the type of the injection point. The spec is very careful to define it that way, but I realize that the distinction is subtle. Does that make sense? Gavin, I’ve updated screenshot for “unproxyable” error.